I wonder how many Kildare fans will make the journey to Killarney on Saturday for the final game of the 'Super 8s'. For sure, if Kildare were still in with a chance of qualifying, the cry would be 'To Hell or to Kerry'. Doesn't quite have the same alliteration as 'Newbridge or Nowhere' does it? There was a time when 'The Road to Nowhere' was always used in disparaging way. The expression came from those crazy famine tracks which often ended up in a dead end, or in the middle of a bog. But now going Nowhere means a big day out in Newbridge. Will we head to Nowhere for a few pints? Newbridge is a boring enough name. Someone built a new bridge I suppose. But Newbridge or Nowhere tells the story of how Kildare stood up to Croke Park and how it was their team won a famous victory over Mayo. Cian O'Neill and the county board earned a big win for Rural Ireland. flogged Kildare have been flogged. The system is unfair on the players and you would wonder what long-term damage will be inflicted on their bodies as a result. For sure, if Kildare were contracted to the IRFU, they wouldn't be expected to play so many weeks in a row. And they all have to face work on a Monday morning. Kerry have had two weeks in a row with a lot of travelling. David Clifford's goal against Monaghan will be spoken about for some time to come but his soccer goal in the dying minutes against Galway may prove to be just as important when it comes to adding and subtracting. I will not attempt to go through all the computations but basically Galway have to beat Monaghan and Kerry have to get a big win over Kildare. The good news from a Kerry point of view is that the team will attack. Kerry are the best team there is when the ball goes in fast. We must gamble but, as they say in 41, we must keep a guard to the knave. There's no harm in playing one sweeper. I would play Jason Foley. He has foot to burn. This slow build-up might work in the bedroom but is all wrong for football. Unless the GAA ban the kick-back and curtail the handpass, the game is dead. The new president is firefighting and he is quenching most of the many summer blazes. The hurling and football semi-finals will start at 5pm. Well done to the GAA for responding to the needs of those of us who live far away from Croke Park. Kerry are still the best chance of stopping Dublin. We are vulnerable to all of the remaining teams but the sight of that blue jersey improves Kerry by five points. We could be out by Saturday night, though, and it's not even August yet, but I think Kerry will scrape through. I spoke to Kieran Donaghy after the Monaghan escape as he made his getaway home. "We are still there," he said, "and we haven't hit form yet. Watch out when we do." That man is an optimist and our team needs men who think big. Donaghy is the Daddy and a funny Daddy at that. His kids are doing great. Young Seán O'Shea is so accurate and mature. Clifford is a prodigy. There was never any danger of his going to Australia. I met his parents and they told me all the young lad ever wanted to do is to play for Kerry. Home is where the heart is and his heart beats for his own. There's a toughness in him, too. The kid was roughed up against Monaghan, off the ball, and he was given the yellow card for trying to free himself from his marker. Clifford is being compared to Maurice Fitz but inside he is as much a Darragh ó Sé. Bernard Brogan Junior said one time: "Kerry would nearly kill you to win an All- Ireland." Now Kerry know that's what it takes. Older Tom knew and Young Tom O' Sullivan knows this too. 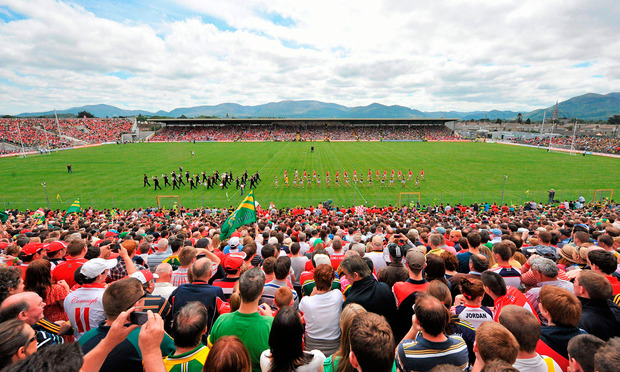 Kerry must be prepared to shed every drop in Killarney. sacrifice To our boys I would say, this is the day when you must show why our county jersey means so much to us a people. You must know there is no winning without a blood, sweat and tears sacrifice. This our home, the place we love. When we were small, our mams and dads brought us here to this place under the Holy Mountain of Carrauntoohil. This is the day we can become a county to be feared once again. You are only a few moves and a few derring-dos away from clicking. Go for glory and glory will be yours. Have a go. A wide is a chance to win the kick-out. Press, press. Work, work. Fight, fight. Keep the eternal flame alive. Never be afraid. Kildare and their manager are so welcome back to Kerry, but for us it's win or nowhere.